I've been practicing my colorwork recently. The reason is I was inspired at the Glasgow School of Yarn to knit Ann Kingstone's amazing Pemberley jumper. However, the only stranded colorwork I've done so far has been very basic, and a very long time ago. So, in preparation for this knitting marathon, I have been in training - working a few more basic colorwork projects before tackling the big leagues. First, I dug a project out of my queue that I've been planning for quite some time. I wanted to knit a jumper that had some colorwork, but not too much. I wanted to knit a jumper out of handspun, but I didn't want to spin a whole sweater. Enter my Caitlin pullover. It's a simple free pattern for a pullover with colorwork on the sleeves, bottom edge, and yoke. I spun up four natural colors of Shetland top as well as some orange top for the colorwork sections, and I had some Lang Shetland Soft yarn (also in orange) to use in the plain sections. I can have my cake and eat it too - work a handspun colorwork sweater, but not have to spin it all or knit it all in colorwork! The colorwork pattern is also deceptively simple - most of the colorwork is done through slipped stitches, not stranding. In fact, there are only a handful of rows in the chart which use stranded colorwork instead of slipping stitches. The end result is much easier to knit than it appears. 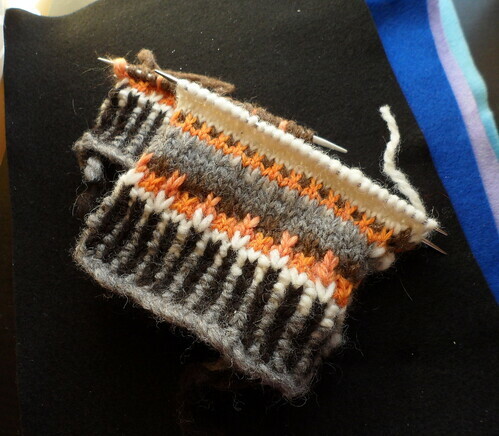 I plan on working a few more small fair isle projects (such as the Endpaper mitts, maybe) before tackling Pemberley. I am really, truly awed by that design but also a little intimidated by it. But, I'm confident that if I take it step by step, I can conquer it! The pink and grey look lovely together - I am thinking it would also make some lovely mitts! Really pleased to read not everyone is experienced in colourwork> I'm just building up to some handspun colourwork mittens, and this blog helps me get focused on that too, thanks!